All the annual subscriptions below with the exception of the fairway category exclude levies due from LGU, GGU & EGU. ​All Membership categories have equal status and are eligible to play in all club competitions. When you join Woodspring you will receive a 10% discount in our Bar and Restaurant. ​Our Fairway Scheme allows you to obtain a handicap and the be eligible to play in club competitions by paying a green fee but without the commitment of a joining fee or annual subscription. To become a Fairway Golfer and obtain a handicap all you need do is register yourself on our system then pay your green fee and play 3 rounds at Woodspring with a member who already has a handicap, on completion of your 3 rounds hand your scorecards to the pro shop, they will then be assessed.After paying the relevant Golf union levies which we collect on theirbehalf you will then be issued with an official handicap. (levies stated above). Full Platinum members can play the course as often as they wish without paying a green fee. Full Gold members can play the course Monday to Friday as often as they want without paying a green fee. Bronze members can play 7 days a week by paying a yearly subscription of £240 and then greatly reduced green fee of £14 per round. Fairway member’s benefit by not paying an entrance fee. There is a small annual subscription of £95 which covers your handicap administration and all golf union fees. A green fee is payable of £22 weekdays £24 weekends. Fairway members who hold their Handicap at Woodspring can also play in all Club competitions. 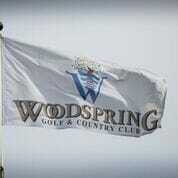 All members are entitled to a 10% discount on food and beverage at Woodspring. All members receive a discount on the Driving Range. Members who hold their Handicap at Woodspring may participate in all Club Competitions and have the opportunity to represent Woodspring at other clubs. Our fixture list will give further details of competitions to be played at Woodspring.